As Serious Games continue to emerge as a useful model for learning at all levels, including higher education, they are showing their versatility in a variety of settings. 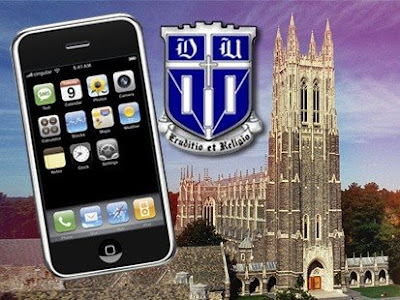 What might a university look like with a fully deployed program of converged devices like the iPhone? Connected is one possible vision. As a university, ACU (Abilene Christian University) has invested much energy considering emerging trends in education. They've done this because their ongoing goal to help prepare students to be critical thinkers, knowledgeable professionals, and responsible citizens calls for continual reevaluation of almost everything that happens in and out of the classroom - even a reevaluation of what constitutes the classroom itself. 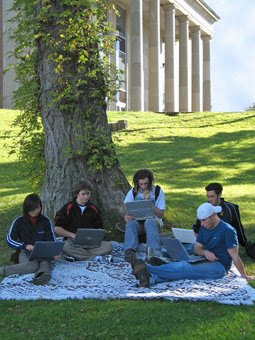 In the spring of 2007, a group of educators, technologists, and administrators at ACU crystallized these ongoing discussions, producing a case for a new emphasis on mobile learning based on ubiquitous information access through powerful, portable, converged devices. Next fall, all new freshmen attending ACU will receive an iPhone (or iPod Touch) when they get to campus. 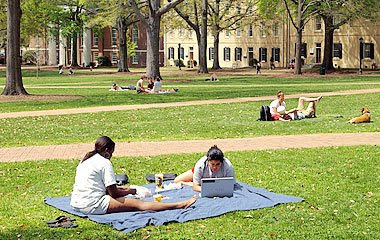 And, from there, the Apple gadget will figure centrally to students’ campus experience. The iPhone is the latest and greatest “converged mobile media device,” which combines in one gadget numerous functionalities — Internet and email access, phone, audio, video, and maps. And once you put a generation of students reared on mobile devices on this common platform, new ways of running the university in the 21st century start to open up. The changes begin with the way university administration gets done. ACU envisions students using their devices to check their meal and account balances, access course calendars, receive news and special bulletins from the university, and tap into the university phone/employee directory. Not far down the line, the university anticipates that the iPhone will fulfill certain registrar functions — meaning that students can use their iPhone to scope out, and even enroll in, various classes. Then, they’ll add some e-commerce to the mix and let students use their mobile device to conduct commerce with the bookstore and university restaurants. Are you starting to get the picture? The iPhone becomes a “one stop shop for information and services” that can be accessed on the fly. But what happens in the classroom? It’s also an added perk that the iPhone will let students contribute to the class through their online persona, which, research shows, “emboldens students [particularly shy ones] who might not otherwise share their ideas.” Then there’s this scenario (and others like it): With the iPhone, the “biology class in the field will be able to photograph specimens, post their findings to other classes not currently in the field, communicate with experts, and use the web to identify and research specimens. Lastly, the iPhone opens up the possibility of creating “hybrid” courses, which means courses conducted partly in the classroom and partly online. To get more insight into ACU’s intelligent thinking about the potential educational applications of the iPhone, spend some time on their “Connected” web site. A team of researchers from UW-Madison, Harvard, and the Massachusetts Institute of Technology is working to develop “augmented-reality” games played with the aid of handheld devices. Their work is funded by the MacArthur Foundation and a Star School grant from the U.S. Department of Education. In one example, a handheld smart phone with an attached global positioning system (GPS) device. The students interview virtual characters and visit actual sites where game events take place. They can go online to gather more information; they can investigate threats and develop corrective strategies as part of the game. One scenario, developed by UW student James Matthews, casts the game player as a journalist covering the events of October 1967 at UW-Madison, when campus protests against Dow Chemical Co. erupted into violence. 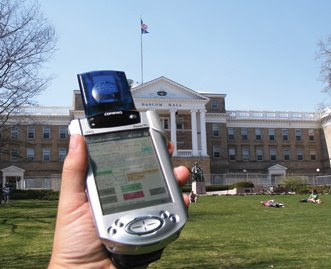 The game player encounters various incidents as he or she walks up Bascom Hill. The student writes a story and later compares it with reporting from 1967. This is an easy fit in higher education,” says Kurt Squire, an assistant professor in the School of Education and lead investigator on the project. So Squire and his colleagues worked with Belcher to put the students into the game. “We made the game player a charged particle that has to move through a field,” he says. “The student created the visualizations.”“There are lots of powerful opportunities here,” says Squire. “With these games, you get the complexity of interactions. The potential for learning is unlimited."